I was there during 68 Tet and they blew it again. Knocked us to the ground and damaged my hearing. Looked like an atomic bomb going off. Yeh played them a time or two. 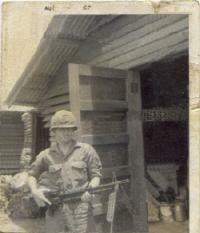 I was at Long binh for the last week of October 1966. About Oct 23 "Charlie" blew the ammo dump. The concussion caused the EM Club roof to collapse on top of me. I'm still in touch with the guy that pulled me out from under all those years ago. Remember the "Penny" Slot Machines?